Combine a variety of mushrooms: feathery brown maitake (hen of the woods) which are cultivated now, royal trumpets, oysters, the upper halves of white enoki, and sliced shitake, which are all cultivated, and then the wild ones if your markets carries them. Right now we are getting hedgehogs (one of my top five mushrooms) and black trumpets from California. 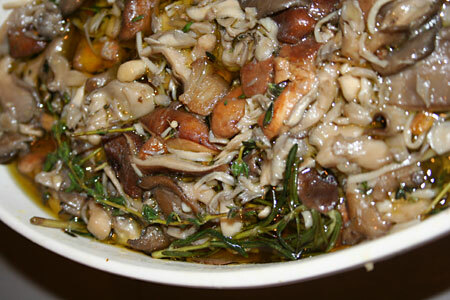 Sautee the mushrooms in cocoanut or olive oil (reserved the thick stemsthey smelled too good to throw away), throw them into a bowl with a marinade of olive oil, white wine vinegar, fresh thyme, rosemary, and a bay leaf, salt and pepper. Cover with plastic and refrigerated overnight. They will hold, covered in oil, for a long week.